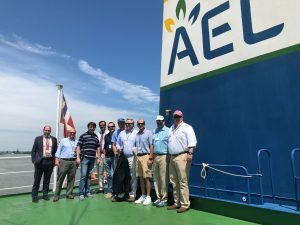 While MV AEC Ability II was discharging steel drilling pipes in the port of Houston, AEC’s CEO Mr. Madsen escorted a prominent Houston delegation to the vessel to experience what is happing in their own home port and onboard an AEC vessel. A warm thank you to Captain Darko Turato and Crew for receiving everyone with great hospitality and for keeping our good vessel in an excellent condition. Mr. Sarofim, Mr. Kempner, Captain Turato, Mr. Lummis, Mr. Madsen, Mr. Seeligson, Mr. Mathis, Mr. Holstead, Mr. Stude and Mr. Curtin.